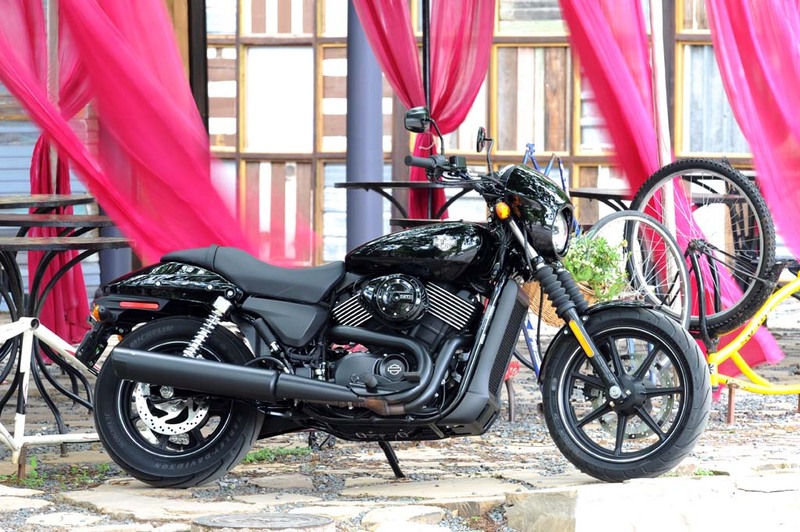 Even for those of us who came up on Japanese bikes, the new Harley-Davidson Street 750 – the Motor Company’s first new model since the V-Rod of 2001 – is perfectly acceptable. All six gears click in and out with nary a bang, and you don’t even need the light-pull clutch past about third. Steering’s quick and light, and ergonomics are really close to standard if you’re not tall. Nobody expected a drag racer, so nobody should be disappointed, but the new liquid-cooled V-Twin runs great, with no stumbles or flat spots, right from idle – and it’s flexible enough to pull from 35 or 40 mph in top gear no problem. One of our competitors managed to get a pre-production Street on a Dynojet 250 a few weeks ago, where it made 57.6 horsepower at almost 8000 rpm. That’s 11 hp more than an 883 Sportster on the same dyno. 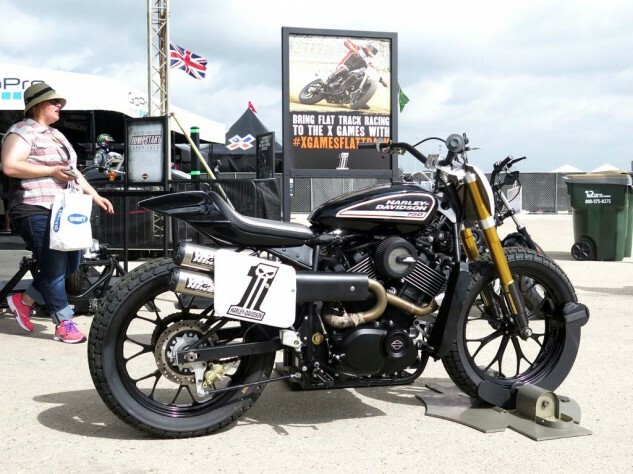 This more than makes up for the fact that the 883 makes more torque down low, and tells you all you need to know about how the new Street 750 compares to the old Sportster: One’s an old-fashioned, undersquare, cam-in-block two-valver with 9:1 compression; the other is a modern, 85 x 66mm, 4-valve-per-cylinder with single-overhead cams and 11:1 compression that likes to rev right into its (hard) limiter at 8000 rpm. Splaying cylinders 60 degrees apart instead of 45 lets the tank snuggle down nice and tight on top of the 38mm Mikuni throttle body. Mainly what strikes you when you see the Street in the flesh for the first time is how small it is. 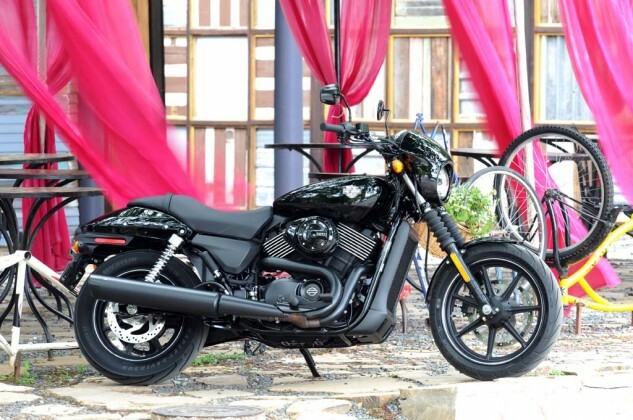 Harley has always gone overboard trying to keep seats low on its “entry-level” motorcycles (all its bikes, really), but this time they decided to just shrink the whole bike. On its website, H-D says a new Iron 883 tips the scales at 562, ready to ride. 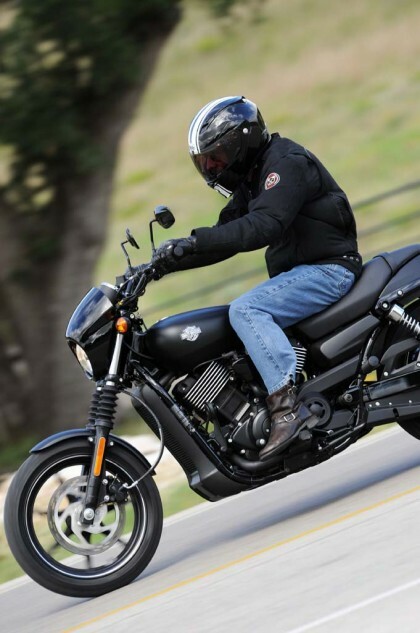 For the Street 750, it claims 489. That’s a huge difference you can feel every time you pick the bike up off its kickstand, every time you accel- or decelerate, every time you go around a corner. 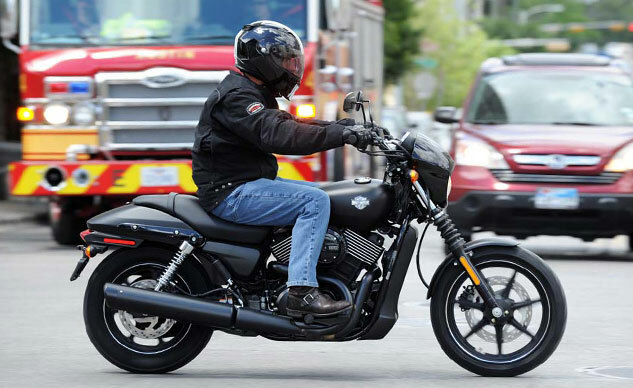 Discuss this at our HD Street Forum. The Street 500 starts at $6799; $7,499 for the 750. But a Mysterious Red Sunglo 750 is going to set you back $7,794. And now for the bad news. To keep the 750’s price down to $7499, a few fit-and-finish corners were cut. The triple clamp castings look like they came out of the sand mold, got painted black and bolted onto the bike. The last time I saw anything like them was on the Cleveland Heist, made in China and no bones about it. Where H-D sometimes goes to great lengths to hide cables and wires on some of its bikes, on the Street it seems to have left everything exposed on purpose. Maybe they’ll be selling a Dark Custom Trim Kit, like they sell to cover the wheels and propane tank on your mobile home? Maybe that’s unfair? It’s my job to find fault, but if you’re looking at what might be your first motorcycle, you won’t notice any of it, will you? Overall, the little Street cuts a low, lean, dashing figure. Its forward-leaning lines, especially the new gas tank, reminded me of the old Yamaha Radian, which was also a great little urban runabout. 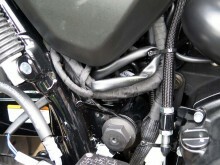 I can’t say something nice about the bike’s triple clamps and wiring harness, so I won’t say anything. Wait! The fork lock is integrated into the ignition switch! Urban is exactly how H-D’s mighty marketing arm is positioning this one, right down to its name and tagline: “The Street is where I live” almost implies it’s cheap enough for a homeless person to afford. At a bar on 6th Street in Austin, while I was there for the bike’s launch, a guy actually stole my half-drunk can of Lone Star. Now that is poor. At 5’8” and about 160 pounds, the thing fits me pretty well. Tall people appeared to be a bit cramped, but I didn’t really hear any complaints after our shortish ride. 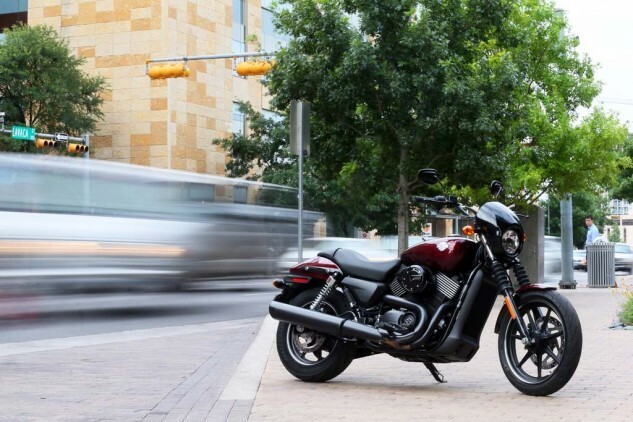 In town, the other Great Leap Forward is 3.5 inches of rear suspension travel – which is about 1.5 more than the Iron 883, and the Street actually absorbs most bumps instead of bludgeoning them with its back tire. The back tire itself is an unusual-sized, flat-profiled Michelin Scorcher with unusually tall sidewalls, which also seems to be really bump-compliant. It’s a 140/75 R15, which I thought maybe the design department had asked for. But Mark Daniels, lead designer on the Street, says the tire was specced by engineering. In any case, the Street goes wherever you point its skinny little 37mm fork tubes with enthusiasm, and likes to be treated disrespectfully like some kind of naked sportbike, even. It’s happy to be flung into corners and put away wet. Suspension is not exactly sophisticated, but well-sprung for my 160 pounds, if a little underdamped when the going gets sporty and bumpy. 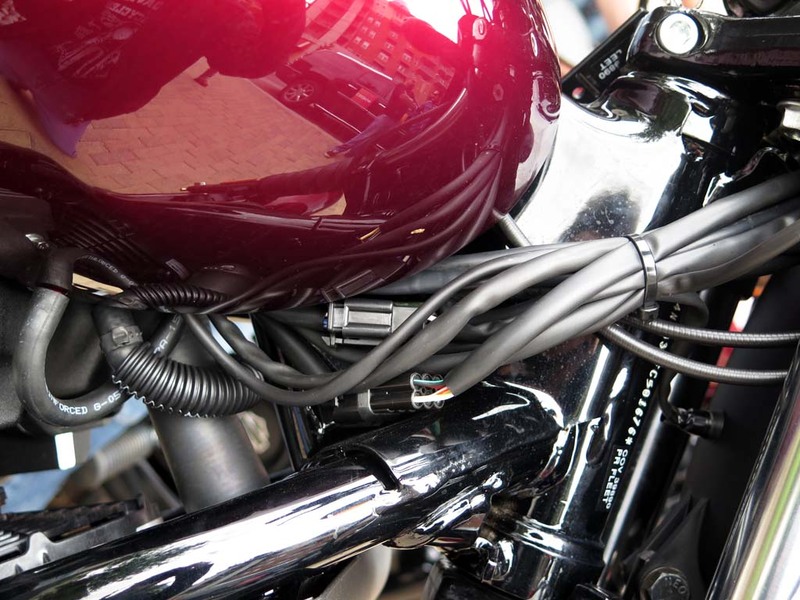 There’s enough cornering clearance to have some fun but not enough to let you forget you’re riding a Harley. The brakes are old-school ABS, ie., the 292mm front disc doesn’t feel powerful enough to lock the wheel. Actual ABS is not available. The dance of the seven veils is over. 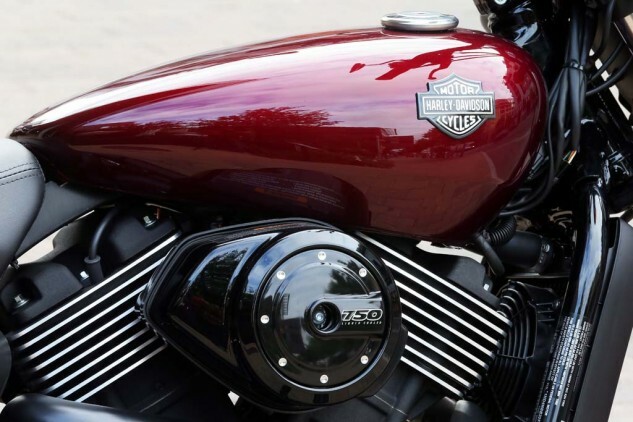 H-D’s first new model since 2001 seems worthy. Speaking of which, H-D claims 41 mpg; I saw 60 miles on 1.5 gallons, so that’s about right. The 3.5-gallon capacity might cause problems for Western-state riders. 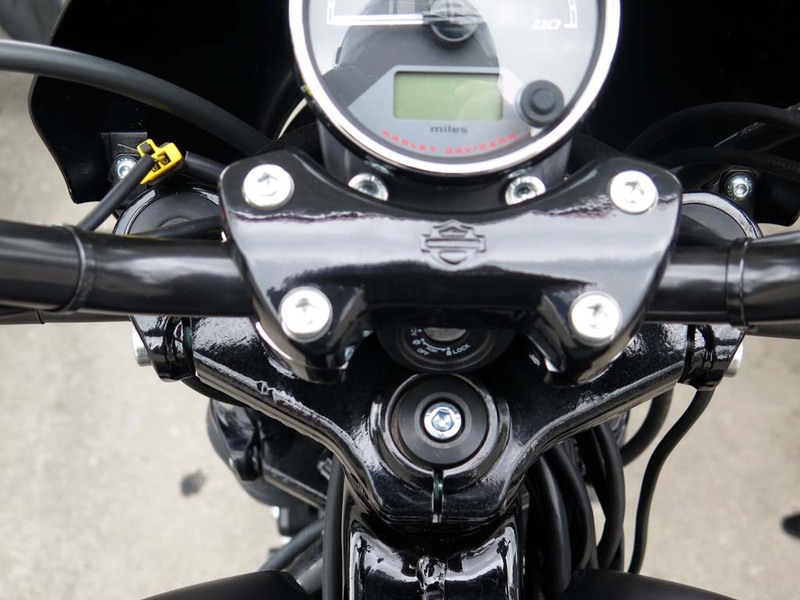 The other thing that might limit long-distance range is significant vibration that creeps into the handlebars at around 80 mph in spite of the engine’s counterbalancer. Whichever marketing genius at H-D decided to throw in with the X Games deserves a medal. They’re pushing to make flat-track racing a new XG discipline, which really could breathe new life into the sport. After it was all over, as I sat there killing time waiting for my ride to the airport and watching the rally car track get set up for the X Games at Circuit of the Americas, I really wanted to like the kids (some of them bearded) on the BMX bikes on the Jumbotron, but it’s hard. I think my generation needs the gasoline, preferably Ethyl. My lunch beer had me almost dozing there in the shade when suddenly a couple of Stadium Super Trucks! making their X Games debut fired up in front of me and started testing out the track – hot-rod V-8s flexing serious muscle – and my eyelids sprang to attention. That’s Harley’s challenge maybe: Will a generation of deprived, clean-living youth, happy well into adulthood with self-propelled children’s vehicles, hop on the fossil-fuel bandwagon? Can they be converted? H-D already has the designers at work showing what’s possible. Aftermarket support is a big advantage for any bike that says H-D on the tank. 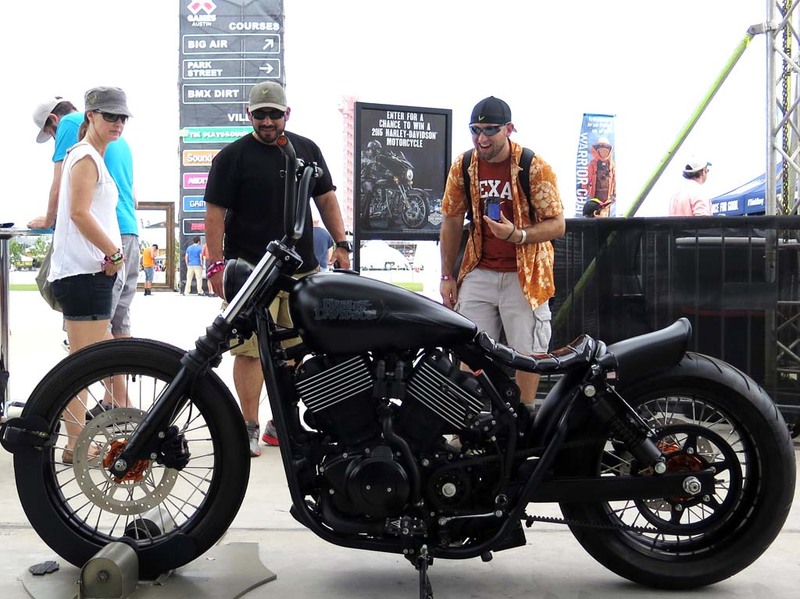 I’m going to go with “yes.” Harley’s display at COTA for the X Games drew plenty of young attention, and my own 20-year old skatepark rat is dying to get his hands on a Street. He already has modifications in mind, which do not include a loud exhaust. He’s still traumatized from his time in the stroller when loud Hogs used to scare the hell out of him. 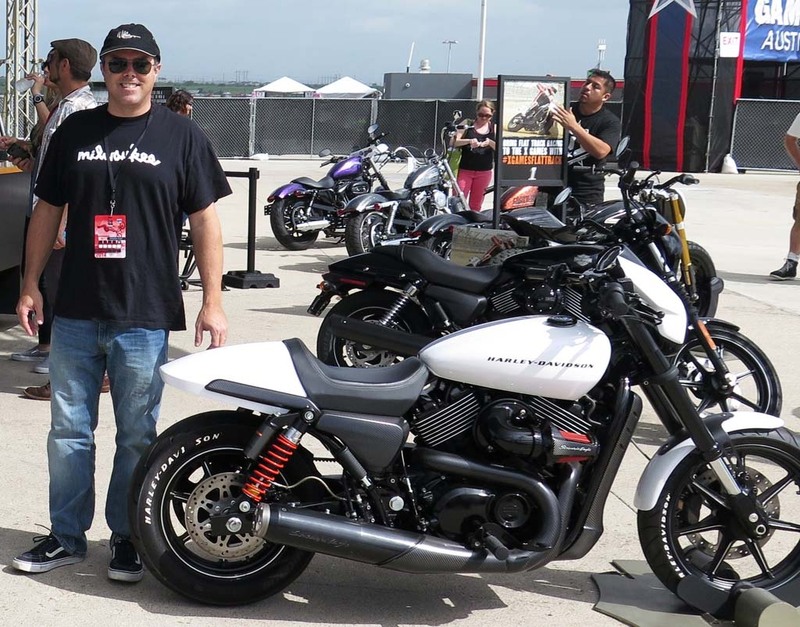 H-D’s Mark Daniels was lead designer of the Street. The boys in the back room have already been working hard on new concepts like the Café bike here, and the jockey shift custom above. Not exactly groundbreaking; wonder what Erik Buell might’ve come up with?